Paramount Pictures and MGM have unleashed a naughty 90-second red band trailer for Hot Tub Time Machine 2. This quick trip through various different eras is full of foul language and plenty of obscene laughs as the original time trippers get addicted to new drugs in the future, fame, and various fashion trends from the past. Grab your 1800s musket and hold on for your life! 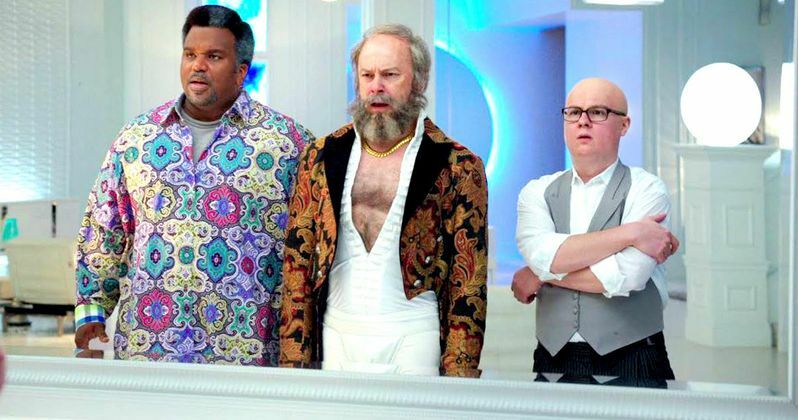 When Lou (Rob Corddry) finds himself in trouble, Nick (Craig Robinson) and Jacob (Clark Duke) fire up the hot tub time machine in an attempt to get back to the past. But they inadvertently land in the future with Adam Jr. (Adam Scott). Now they have to alter the future in order to save the past...Which is really the present, in the sequel from the same team that brought you the original cult hit. Watch as Adam Jr. misinterprets Lou and Nick's favorite song, a new synthetic halucinagine is passed around the group with ill effect, and the beginning of the Civil War gets off to a very bloody start. Even the Beatles get a reboot, but it's not one that's going to make Lou too happy. Grab your swimsuit and jump in, this is going to be one adventure that defies the laws of time and space, and future hairdos.